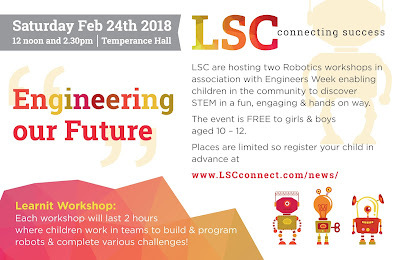 LSC are running a free workshop for 10-12 year old Girls and Boys, at Temperance Hall on Saturday the 24th of February 2018. Each workshop will last 2 hours where children will be introduced to the world of Robotics. The aim of the event is to inspire young people to explore Engineering career paths and highlight the diverse opportunities Engineering has to offer. Tá LSC ag reáchtáil ceardlann saor in aisce do Chailíní agus Buachaillí 10-12 bliain d'aois, ag an halla temperance ar Dé Sathairn an 24ú Feabhra 2018. Beidh gach ceardlann 2 uair an chloig ar fhad agus beibh paistí tugtha isteach i saol na Róbatach. Is é aidhm an hócáide ná daoine óga a spreagadh chun bealaí gairme Innealtóireachta a iniúchadh agus béim a chur ar na deiseanna éagsúla atá ag Innealtóireacht a thairiscint. Táimid ag tnúth le tú a fheiceáil ann.